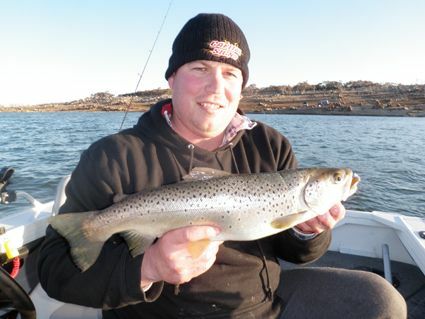 Eucumbene fishing has been great for troll and bait with the fly fishing also starting to pick up. 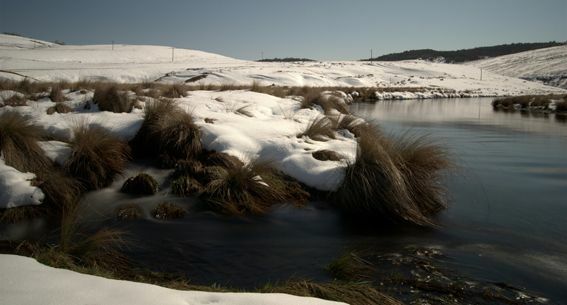 Photo below is the Eucumbene river at Kiandra. A bit of snow and a reasonable flow should see the lake starting to rise in coming weeks. *The two man fishing team of "He who is Possessed" and "The Sook" AKA Dave and Bushy have been fishing in all weather conditions over the last week and managing to catch a few rainbows walking the shore. Better weather has produced better fishing with rain, wind and lightning sending one of them into hiding in the tent afraid to venture out. 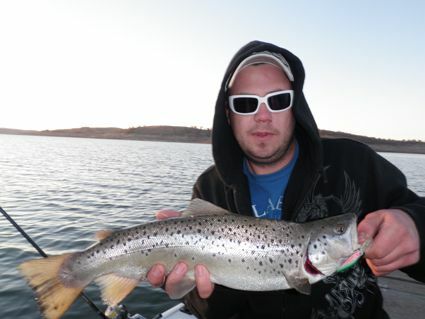 Better weather eventually did bring him back out onto the lake and the fish responded well. 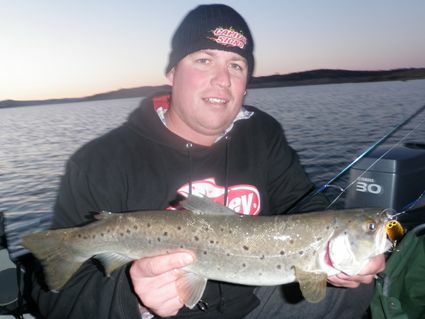 Lake Jindabyne:- Jindabyne reports have been tough despite conditions for polaroiding were outstanding on the weekend but the finding fish with the rising water has been difficult by all accounts. 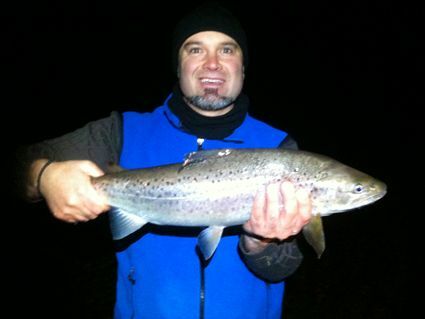 Nightime fishing reports have been quiet too but may be a better option currently. All this will change as the rising lake level covers newer ground and warms with the onset of Spring. There will be some fantastice shorebased fishing in coming weeks. Lake Tantangara :- Reports have been quiet with access difficult due to all the snow of the last week. With the lake at 17.7 % the fishing will be good if the lake continues to rise over the next few weeks. 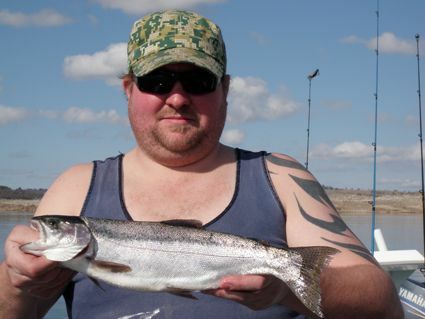 Overal the lake has been fishing very well on the troll with diving minnows being the most effective producing fish. *Jay Allen and his mates from Canberra have had yet another good weekend trolling. A mixture of browns and rainbows on diving minnows. The pictures show the range of sizes and lure types used. 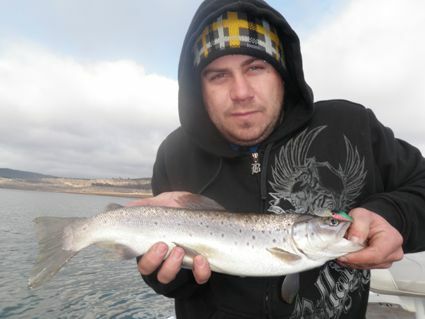 Best lures this week were Viking minnows, tassie's in purple and pink and a virtually any minnow in rainbow trout colours. Boat launching is still very good at the Old Adaminaby ramo and Jacqui from Buckenderra reports that they have moved their ramp to a new spot and is working well. Good weather does not necessarily mean good fishing hey! *Andrew Badullovich and his crew had a fantastic weekend at Buckenderra capturing fifty two rainbows and one brown for the weekend. Best baits were Gulp in the Orange Pulp, Sherbert Burst, and Rainbow Candy. 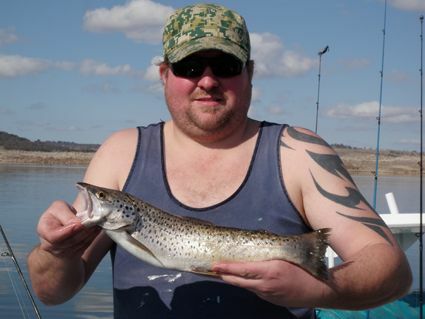 Biggest fish was the loan brown at 1.5kg and a 1.2kg rainbow. "Awesome fishing, the best we have seen" he said. *Daniele sent this report (below) in a week or so ago and I missed putting it in. Apologies Daniele a really nice fish. "I'll happily get woken up at 3.00am every morning if this is what I wake too. I was woken by the sound of my drag screaming as line was peeling off and you can imagine my excitement when I landed this jem. She's my personal best and the only thing better than reeling her in was to watch her swim away to fight another day. Now I just need to catch one of this calibre on fly." 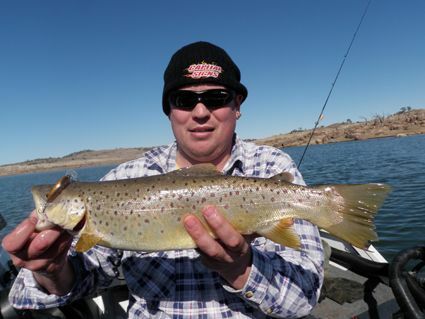 *Glen Hajdu had a good couple of sessions last week landing eighteen rainbows and two browns between himself and his son. 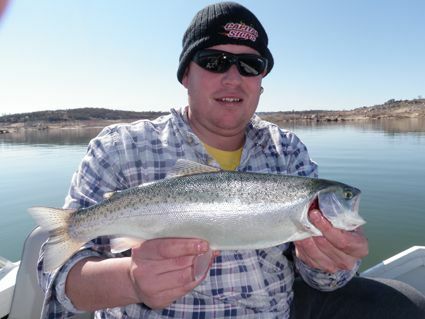 The rainbows ate Powerbait while the browns were on a scrubby and a grub. 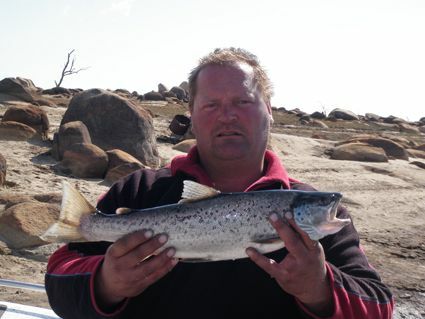 The browns were the better fish and were 50cm and 54 cm. Glen was fishing in the Rainbow pines area.